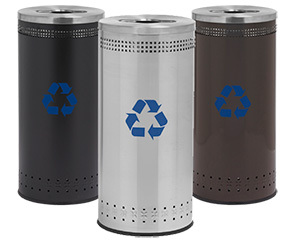 Precision Series 360 Degree Imprinted Recyclers provide a 9" x 4" mouth opening offering users 360 degrees of convenient hygienic access to dispose of any mixed recyclables. A removable galvanized liner with attached handles comes standard inside the container for hassle free servicing. 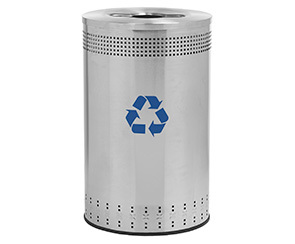 Constructed with heavy-gauge 304 stainless steel, these large capacity recyclers offer no exposed seams or welds and are virtually maintenance free. The base of the unit features rubber rings to keeps receptacle in place and protects floors. Seven Specialty Decals (7" x 1-1/2") are included: Mixed, Organic, Cans & Bottles, Paper, Glass, Aluminum, Plastic and one standard Recycling Logo (7" x 7").